NADCA Chapter 30 holds its annual industry golf tournament with the American Foundry Society Southern California Chapter. Together, this metal casting industry gathering is almost always a sold out event. Enjoy a relaxing day of golf and networking in Southern California. Breakfast, lunch, snack bags, and thousands of dollars in raffle prizes makes this a full and enjoyable day. Suppliers to the industry are encouraged to support the metal casting industry with a golf tee sign sponsorship. 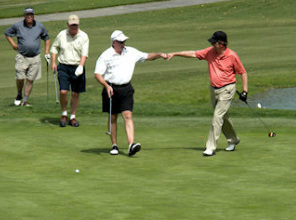 Individual golfers should sign up early and pair up with your favorite golf partner. We look forward to seeing you on the golf course.